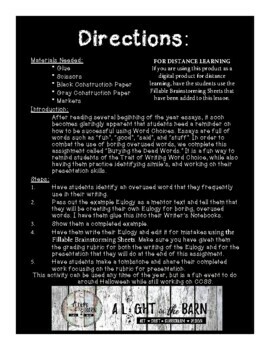 After reading several beginning of the year essays, it soon becomes glaringly apparent that students need a reminder on how to be successful using Word Choices. Essays are full of words such as “fun”, “good”, “said”, and “stuff”. 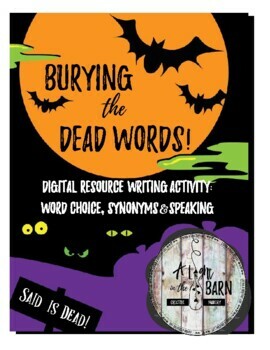 In order to combat the use of boring overused words, we complete this assignment called “Burying the Dead Words.” It is a fun way to remind students of the Trait of Writing Word Choice, while also having them practice identifying simile’s, and working on their presentation skills. 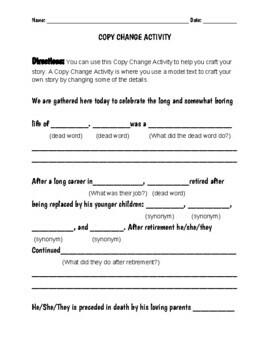 I have used this in grades 4-8. * identify overused words that they frequently use in their writing. 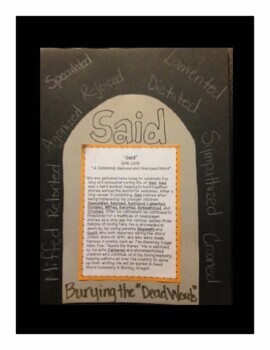 * create a Eulogy using a mentor text for boring, overused words. * has them present their finished writing. * identify simile's for boring words. * Speaking: Integrated Visual Display to add interest for presentations. * Use precise vocabulary to inform about a topic. * Use precise words and phrases, descriptive details, and sensory language. * Determine the meaning of words and phrases analyzing the impact of word choice. * Presentation skills such as eye contact, volume, and clear pronunciation. This activity can be used at any time of the year, but is especially fun around Halloween.